Suitable for experimentation in Corel Painter or Photoshop. I’ll upload more versions as I continue. By the way…where’s he off to? 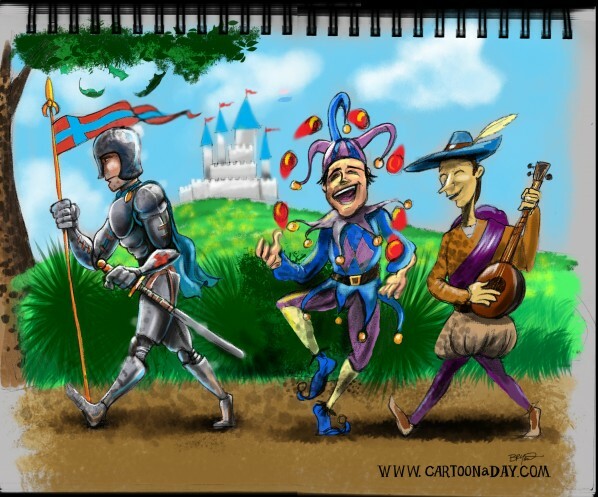 (To storm the castle, joust with the dragon, and save the damsel I suppose). A knight in full body armor holds a flag and marches off. The knight has a serious look on his face and has a tight grip on the handle of his sword. 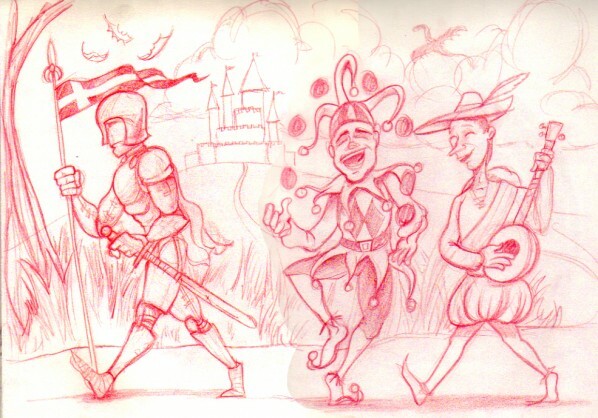 He is followed by his party which includes a court jester who is smiling happily, dancing, and juggling. The third member of the party is the minstrel who is also smiling, and playing a lute or guitar. Inspiration: World of Warcraft paladins. Media: Red pencil on sketchbook. Process: Sketched, scanned at 300 dpi.